I need to run 12v across 30 feet of 18 guage wire. The device on the other end consumes 2 amps. I have a 12v power supply (rated 3A) and I want to ensure the device on the other end gets the full 12v. I found this post voltage loss calculation but I'm not clear on something. If my power supply can put out 3A and the device only needs 2A, does that mean there will be no voltage loss? (there is no sense wire) Will the full 12v arrive but there will be current loss? I found 18 guage copper wire has resistance of 6.385 Ohm/1000 feet. so 6.385 * 60feet/1000feet * 2 amps = .76v loss. I'm afraid not but the loss that does occur at 2 A will be less than that for 3 A. Will the full 12v arrive but there will be current loss? Current loss implies a partial short-circuit between the feed and return wire - e.g., poor or leaky insulation - and this is unlikely with modern insulating materials. As explained above the voltage will drop. 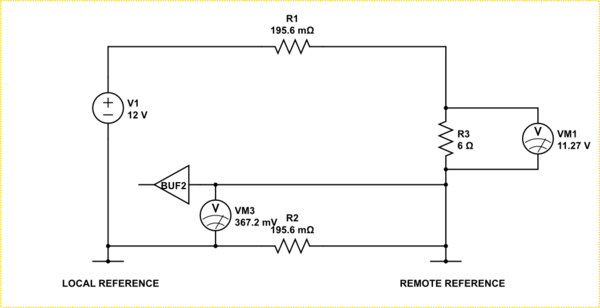 If you have an option, you could transmit the power at a higher voltage and reduced current and step down to 12 V at the load. AC won out over DC due to the ease of voltage transformation to minimise transmission line losses. I don't know the exact current draw of the device yet, but I'm told 1 - 2 A is most likely. Its a computing device so it might be sensitive to the full 12v. It is close to 100% certain that the computing device will use either 5 V or 3.3 V internally for the logic. The 12 V supply will be regulated down to the required voltage. There may be some other components such as display or backlight but these are most likely to be tolerant of a volt variation in voltage. i.e., The device requires 12 V nominal. If there is no adjustment pot accessible from outside there won't be inside a sealed unit. This is what you actually have with a 2A load and 30ft of 18 Guage. As you can see, voltage is dropped over both the wires leaving you with 11.27V at the load assuming the load is constant. However, loads are seldom constant, and that 6 ohms can easily, and randomly, increase to hundreds of ohms depending on what the load is doing. At that point the current falls and the voltage seen across the load becomes much closer to the supply voltage. As such, increasing the supply voltage to compensate for the worst case drop can cause over-voltage issues instead. The latter can be much more damaging. The other issue you need to worry about is if you are transmitting signals between the local and remote device. Because of the voltage drop along the wires there is now a difference in reference levels at each end of the wire. In the schematic above the low level digital signal is being sent back from the remote device, however, that signal is at a higher reference level than the local device. As such the local device sees a higher than normal low level on the wire. If that difference is high enough the logic may not work. If the power currents are switching, the power switching noise, caused by the changes in the voltage drop, will be coupled directly into the signal line. If it is not too bad, that may be acceptable on a digital signal, but is a killer on an analog signal. Not the answer you're looking for? 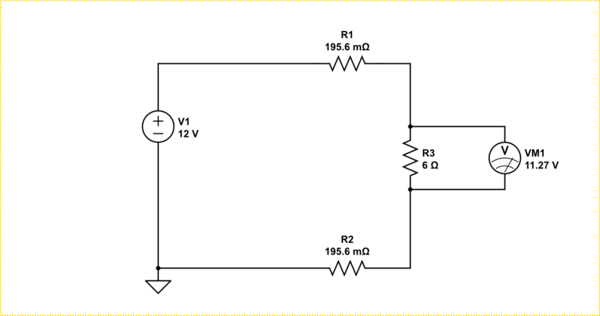 Browse other questions tagged voltage current wire or ask your own question. What gauge wire for 36V (DC), 5A peak? Why do you need a thicker wire when wire length increases? Why does ATX power supply claim 60a at 12v when it only has two 18awg 12v wires? Relationship between voltage/current & LED strips?